Are you looking for ways to increase your income? These days, there are tons of side hustles you can use that didn't even exist just a few years ago. It doesn't matter if the economy is good or bad, there are literally hundreds of creative ways to make money if that's what you want to do. Whether you want to pay off debt, save up for something special, invest, or start a side business, in many cases you can start making money quickly with the right ideas. I am a firm believer that, no matter what the economy is doing, there is always a way to make a few extra bucks. You just have to be willing to be creative. In today's post, I'll share 10 side hustles you can use to make extra money now, no matter what the economy is doing. If your skilled at arts and crafts, set up a shop on Etsy and sell your products there. Etsy is an online arts and crafts marketplace connecting you with people worldwide looking for unique products. It definitely easier and more efficient than setting up shop at a flea market or trying to convince a boutique owner to carry your products. If you're not sure what to sell on Etsy, just go to their home page and browse. You'll see tons of unique ideas there. You can sell a variety of items such as art, jewelry, clothing, home decor, and tons more! It's a nice, creative way to make money that you could eventually turn into a full time job working from home! It doesn't matter if you do creative writing or auto repair. If you have any type of marketable skill, then you can get a side job freelancing. Unless your employer doesn't allow it, freelancing an excellent way to make a side income in your spare time. Have you ever seen a car wrapped in advertising? They're not always driven by people promoting their own business. Some businesses actually hire people to wrap their car in advertising and pay them a monthly fee for the privilege! Depending on your driving habits, where you live, and how much the advertiser is willing to pay, you can make several hundred dollars a month simply driving your car! This is one of the most creative ways to make money I know. It takes literally zero effort once you set it up! Rent out your house, a single room, or even space on your couch! All you have to do is set up your listing on the AirBnB website. You can set your own nightly, weekly, or monthly rate for a stay. Plus, you always have the power to approve or deny anyone who wants to rent from you. Participants rate each other, so you'll know if someone has a good reputation when they attempt to book your space. One cool feature is that AirBnB will send a professional photographer to take pictures for your listing at no charge! That way, your listing will be presented in the best light possible to maximize potential bookings. Here’s a quick video to show you how AirBnB works. Did you know you can sell your photos online for cash? If you have any skills at photography, this is one of the more creative ways to make money you'll find. You may already have a collection of photos you can upload. If not, browse some of the popular stock photo sites to get some ideas of what to shoot. Typically you'll make anywhere from 25 cents to a few dollars when someone purchases one of your pictures. You definitely won't make a million dollars this way. But as you build a portfolio, you can sell the same pictures on multiple sites. Even better, you can sell each picture an unlimited amount of times! Therefore, if you provide plenty of good quality photos, it can become a steady stream of income over time. at sites such as Adobe Stock, Alamy, Shutterstock, istockphoto.com. Selling stuff on Ebay is easy. You can literally start selling in just a few minutes! Best of all, you can sell just about anything there. You can buy stuff at your local overstock store, Goodwill, or just clean out your basement and sell those items for a profit! For example, one good side hustle strategy is to buy and resell children’s clothing. Just purchase the items at a yard sale for $.25 to $1 per item and group them together into outfits for resale. Of course, items in good condition tend to sell better. But I’ve personally sold things like broken electronics on Ebay as well. Many times people purchase broken items just for the parts! There is no limit to what you can sell on Ebay. Just remember to buy low and sell high! Car detailing is a great side job to make extra money. People are busy, and often they don’t want to take up valuable time keeping their car clean. That’s where you come in! You can work part time detailing cars. One good strategy is to offer detailing services at businesses with a lot of office workers. This allows you to detail many cars in one location while the vehicle owners are working. It’s not complicated work, and if you do an excellent job you’ll have a steady stream of customers! I wrote a post about how to set up and run your own car detailing side hustle. Click below to check it out. Yep, this is a pretty standard recommendation. But hey, it works! If you have large items such as furniture or appliances that you need to sell, you can usually get rid of them quickly and make a nice chunk of extra money in a short time. Garage sales are a good bang for your buck because you can make money and declutter your house at the same time! Whatever items don't sell, you can donate to Goodwill and get a tax write off at the end of the year. Unfortunately, garage sales usually aren't great as a steady side job, but it's good if you need to make some fast money on the side. 10 Creative Ways to Make Money No Matter What the Economy is Doing- Have you tried any of these? This is a popular side hustle made popular by Dave Ramsey. Dave has recommended for many years that if you're getting out of debt, delivering pizzas part time is a great way to make extra money. If you do a great job, you'll earn tips in addition to hourly pay. In just a few hours a week, you can earn a nice little side income to use for whatever you need! Starting a blog is one of the most creative ways there is to make money! It doesn't cost much to start, and the earning potential is unlimited. I personally know people who make anywhere from a few hundred dollars to over a $100,000 a month blogging! It's a great way to start a side job on your own time, with the potential to make a full time income later. One great feature of starting a blog is the potential to grow your income relatively quickly. Once I became more serious about growing my blog income, I grew it to 8x what it was the previous year! My next goal is to increase it another 8-10x over the next year. Starting a blog is easy, but it does take some time to get established. The most important thing is to stick with it and eventually you'll see great results! My FREE email course gives you everything you need to start blogging the right way. You get lots of excellent, free resources, plus plenty of ideas for monetizing your blog once you set it up. Click here to sign up for my FREE “How to Start a Money Making Blog” email course. Creative Ways to Make Money are Everywhere! These are just a few of the creative ways to make money you can use to pay off debt, invest, or just make some extra pocket money. It doesn't matter if the economy is good or bad, due to the power of the internet and its ability to connect you with billions of other people, you can literally start a small side job or a global business right from your laptop! There has never been a better time in history than right now to start a side hustle you can be proud of! 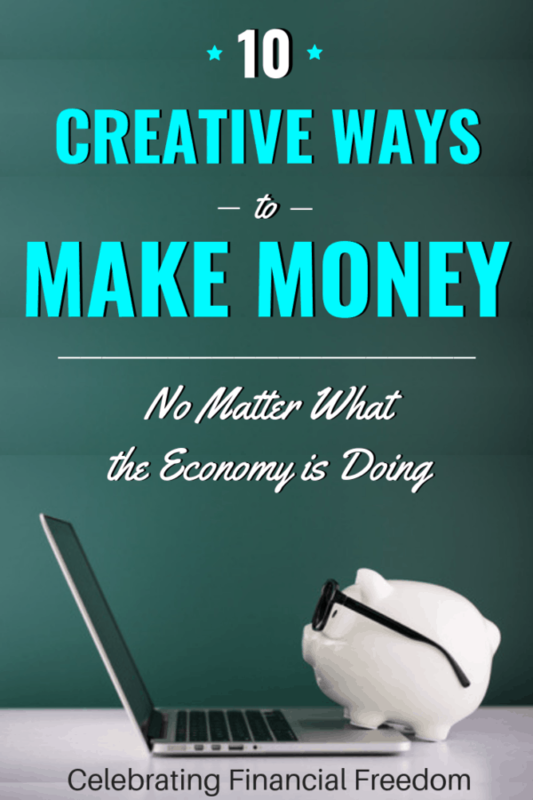 There are tons of creative ways to make money, no matter what the economy is doing. 10 side hustles you can start now and make extra money tomorrow.